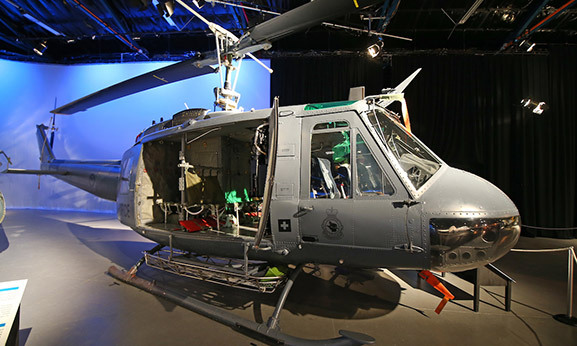 The Iroquois is one of the world’s most iconic helicopters, famous for its extensive role in the Vietnam War and distinctive ‘whock-whock’ sound. The Iroquois first entered RNZAF service in 1966, with five aircraft operating with No. 3 (Battlefield Support) Squadron at Hobsonville. Nine more were delivered in 1970. Two aircraft were based for many years at the No. 3 Squadron Detachment at Wigram for Army support and search and rescue duties, and four served in Singapore until 1989. RNZAF Iroquois were used in the Antarctic, in the South Pacific (especially in Bougainville and Solomon Islands), and in Timor Leste, performing a wide range of duties, before finally being retired from service in 2015. NZ3801 was the first Iroquois received by the Air Force, arriving at Whenuapai on board an RNZAF Hercules on 15 June 1966. It was also the first to fly in New Zealand, as well as the first to be deployed on exercise overseas. It has operated in Fiji, Singapore, and Timor Leste, and was involved in many disaster relief missions, including the Christchurch earthquakes, as well as extensive search and rescue work. In its 46-year service, it flew an incredible 15,000 hours, far beyond the manufacturer’s original design life.